Last Christmas, my brother gave me “The Snowball: Warren Buffett and the Business of Life“, by Alice Schroeder. He completely hit on the spot, though I only started reading it during last August holidays (Luca also started reading it to the point that she ended up buying her own Kindle version of it!). The book is a thorough review of Buffett’s life, including relationships with family & friends and investment decisions. I had previously read other books about Buffett, but they were merely about his investment “strategy” so to say, nothing compared to this one. To complete the book, the author made over 250 interviews, so you can imagine the many insights contained in it. The Inner Scorecard: the idea of acting and valuing yourself according to what you care about and not according to what others’ deem important. The concept of margin of safety: from Benjamin Graham (recommended reading “The Intelligent Investor“). Circle of competence: the idea of looking for simple business that have an enduring competitive advantage (technology companies are not that simple). Cigar butts: companies which are worth more “death than alive” (looking for cheap price to book). Snowball: the idea that compounding interest acts as a snowball falling down the hill, the sooner you start the larger the ball will be down the road (thinking about retirement here). The story of the genie: or that you should invest in your own health as your body is the only one you are going to be given in this life. The Ovarian lottery and the idea that philanthropy achieves more if exercised now and trying to maximize its impact. Throughout the book you get to learn about many great entrepreneurial characters (e.g. Rose Blumkin, Bill Gates); about the workings of the board of directors of some companies (e.g. Coca Cola, Berkshire Hathaway); about some of the most impressive falls in corporate history (e.g. Solomon Brothers, Long Term Capital Management); about several depressions, recessions and crisis; and above all you learn about what were the thoughts and calculations behind some of Buffett’s investments decisions since the early 1940’s to date. I definitely recommend this book (700+ pgs.). Today Spanish financial press gave some coverage to a study performed by Randstad, “Employer Branding: cuando la percepción puede convertirse en realidad”. 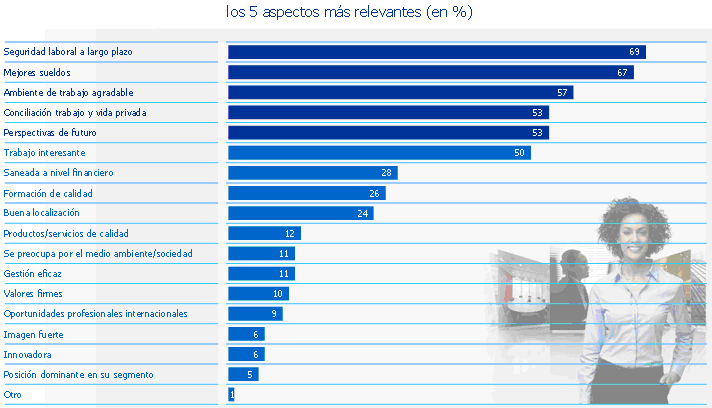 To compile this study Randstad interviewed 10.000 workers between 18 and 65 years old in Spain. Long-term stability, 69% of respondents. Randstad found a high variability between men and women respondents and between different age groups. Other remarkable companies: GlaxoSmithKline, Nokia Spain, Pfizer, Correos, Coca-Cola and Iberdrola. The first is a personal anecdote. I have always preferred Coca-Cola over Pepsi, one of these people who had never bought a Pepsi in a supermarket. In 2007-2008 I did a test at home to see whether I was able to distinguish one from the other. I did the test with my partner. I was blind-folded while she poured same amount of Cola and Pepsi in two identical glasses. She left them for some couple minutes in the fridge so they would get same temperature, etc, etc. Then I tasted them. After trying the first glass I said “Pepsi, I don’t even need to try the other”. Then I thought it twice. I tried the second glass. Thought for some seconds. Then again the first. Then… then… I mixed everything in my mind and couldn’t distinguish one from the other, to the point of changing my initial choice and being wrong. Whenever I tell this story to my friends, they tell me “I can distinguish them”: I challenge you to do so. Find a helper and take the test. Please let me know the result. This is a TED talk by Benjamin Wallace on the price of happiness. Benjamin goes exploring different luxury articles and finding that they don’t bring him or those close to him any special feeling. He indeed does a similar test to the one I did, this time with luxury oil, with more varieties to distinguish and more people to try them, the result… guess it. After having read the case of the fake Pinot Noir, having suffered the non-distinguish ability of Pepsi and hearing to the TED talk cases… we might wonder: why are we mislead so much by perceptions? Why do we pay more for something that doesn’t bring us any enhanced customer experience except for being able to tell that we paid that amount for this? The Dutch are well known for being a very pragmatic nation. Here you have a case, again, for wines (just to close the loop). What do you care about the brand of a wine? Let’s remove it. What do you appreciate in it? Is it the grape type? Is it the fruit flavour, the tannins? So that’s what you need to know!! The rest… better to call it “4. Red Wine” and remembering that it comes in a blue bottle… check it: http://94wines.com.